Eleven years ago tomorrow, the Cottrell clan gathered at the home of Cladyne Cottrell Barrett in Kents Store, Virginia, after the funeral and burial of one of what the family called the Outlaws: those souls hardy enough to marry into our boisterous, raucous, often misbehaved family. Harold Kent Richardson was my oldest cousin’s husband. And he was the first of my generation to be lost to us — a victim, at the age of 62, of lung cancer. A lifelong Virginian, Harold was the son of Warren Kent and Dorothy (Martin) Richardson. He married my cousin Bobette Staples Barrett in 1971. They worked together, played together, traveled together. True soulmates, they were inseparable by anything in life. I don’t think Bobbi ever quite recovered from losing him. We all loved Harold. You couldn’t not love him. He was a sweet and gentle man and he loved Bobbi with all his heart and soul. He treated her the way she deserved to be treated. And we honored and treasured him for that. But I have to thank Harold for something else today, these 11 years later. Because it was at that gathering after his funeral that I looked around — really looked — at my aunts and uncles who’d come to pay their respects. The photos you see here, taken that day, show five of my mother’s siblings. In the top photo at the back in the white top and black pants is my Aunt Marianne. The man in the USS Hornet cap is my Uncle Billy. In the front reading the book is my Aunt Cladyne, Harold’s mother-in-law. In the bottom photo, Clady is on the left, my Aunt Carol is in the middle and my Aunt Trisha is on the right. For the first time, on that day in June, as I looked at those dearly loved faces, I let myself accept the reality that they were getting older fast. That our family stories were in serious danger of being lost. That we’d already lost my grandparents and what they could have told us. That we’d lost the stories my late mother and uncle Monte could have told us. That we were in danger of losing the rest of the stories of my mother’s generation. That even my own generation was truly mortal … and our stories, too, could be lost. As painful as those realizations were, I am so grateful for the day that made me face them. For in the years that have passed, we have lost so many of the people who were there that day. Marianne in 2007. Billy in 2008. Clady in 2009. Bobbi herself in 2011. Carol in 2012. But at least some of their stories were saved. I have not walked the paths of my family’s past alone. 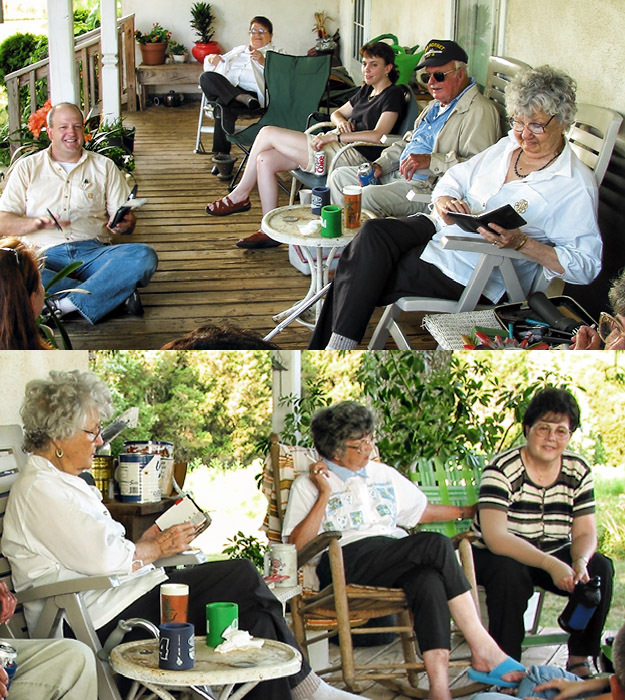 The young woman seated between Marianne and Billy in the top photo is my cousin Paula, who was also looking around — really looking — on that day in June 2002. We all have good cause to be thankful for that, too, since Paula has done every bit as much as and more in some respects than I have done with our family history. Though we might eventually have done as much as we have in the last 11 years, we might well have lost some of the precious stories we managed to capture. And for that we thank you, Harold. Your death was our loss, yes, but the warning bell it sounded was heeded. Out of the darkness of a funeral and a burial has come light shed on our past. An excellent post with a message that we all should remember — and act on! Thank you for sharing this story! A lovely tribute to Harold & your family. Thanks, Julie. We all owe him a lot. Aww! You give me too much credit. I am so glad we started then. Sure, before might have been nice, but, who knows, we might not have gotten the stories we did. Nope, Harold gave us a heck of a gift. I do NOT give you too much credit. You give yourself too little. So there. Marvelous post! Thanks. (The family resemblances are striking!) I started at about the same age, but I was a very late child of a youngest child, and more of the people I wanted to finally talk to were already gone…. Thanks, Linda — those Scots-Irish genes do tend to win out, don’t we? We like to think we will always have these special people in our lives but time does move on. This is a good reminder that we must use today’s opportunities while we can. I think we genealogists tend to forget that too often, Colleen. We go after the stories of the past — and forget those of the living. You must feel so gratified and relieved to have come to your realization “just in time,” when a goodly number of your family stories could still be recovered by you and Paula. Congratulations on acting to save the memories! It’s so important. I sought out my older cousins in 2004, and that has turned out to be just in time also. They were/are so happy about the family memoir I wrote with the cooperation and vast help with research. It’s a sense of completion and also a beginning. Since then, we have seen several deaths and much, much debilitating illness — but we have also had a family reunion and renewal. All this work we do is as important as it gets. I am humbled, Mariann, more than gratified or relieved. Thanks for the important reminder. We recently lost one of my husbands aunts and it is a grave reminder at how time marches on and how I better get busy collecting more stories. Sometimes it takes a real wake-up call, doesn’t it? And we lose some stories every time we wait for the wake up.